Quicklinks: Email Me | Ulster-Scots Projects | Mark Thompson Design | Thompson Brothers Music | What is Ulster-Scots anyway? Personal blog of Mark Thompson. Formerly Managing Director of GCAS Design in Belfast, Northern Ireland (from 1999 - 2006) and Chairman of the Ulster-Scots Agency (from June 2005 - June 2009). Thoughts on Ulster-Scots heritage, identity, evangelical Protestant faith, music and other stuff I stumble upon. Christianity and Islam - "there is no good news"
I make an appearance on this new BBC Northern Ireland series which starts on Sunday night, presented by William Crawley. Can Ulster be re-imagined? Is there more than just the stereotype? I believe so and it is starting to emerge. 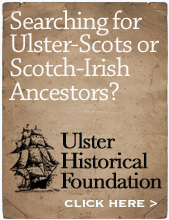 Late last year I worked on AuthenticUlster.com, a new brand and heritage tourism initiative. And the beautiful new magazine Freckle NI is another example. Politics has an important place in every society, but it should not define everything we are and everything we do. Culture runs deeper and is less subject to change. 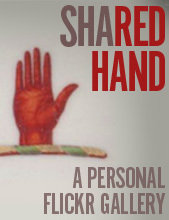 A cultural understanding of oneself is far more enduring than a political one. 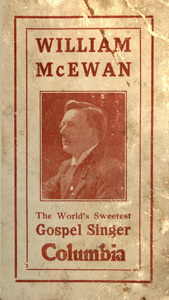 William MacEwan - the voice of "The Old Rugged Cross"
'... Good sales could not always be guaranteed, but Columbia scored an equally important success with its 1927 American recording of Scottish-born gospel singer William MacEwan's rendition of the hymn "The Old Rugged Cross" coupled with "Let's talk it over bye-and-bye" (Columbia 4148). By 1933 British sales of this record had exceeded 250,000, at a time when all but a handful of the most successful dance and popular music record enjoyed sales of 100,000 and most record companies considered sales in excess of 10,000 copies a "hit" ...' - source here. One of the first books I bought when I became interested in Ulster-Scottish history was William C Mackenzie's 1916 400 page volume The Races of Ireland and Scotland (now available on Archive.org.here) - found in a long-gone second hand bookshop on Gray's Hill in Bangor. It mostly deals with ancient history and perhaps, like many Victorian-era publications of this kind, has been superceded by later discoveries and scholarship. Mackenzie drew upon numerous Irish sources and painted a picture of a regular two-way criss-cross of communication and migrations across the North Channel throughout time. The Picts and Cruthin get numerous mentions, as do linguistic issues. At the time, in my early 20s, I was a bit disappointed by it. Its history was too long ago, and its geography too far away, to seem relevant to me. I preferred buildings I could touch and take photographs of, words I could still hear and had grown up with myself in my community, surnames I recognised and history which was around my own home turf. Now, however, the book interests me more. William Cook Mackenzie (1862-1952) argued the case for a regional appreciation of Scotland, and Ireland, and of the multiplicity of cultural influences which had shaped Scotland - such as the Scandinavian / Viking influence of his native Western Isles. Born on the Isle of Lewis (an island bizarrely claimed by earlier historians to once have been inhabited by a race of pygmies and where pygmy remains had reportedly been found - a theory which Mackenzie, his brother and his cousin investigated and published a paper on in 1905) he was a Fellow of the Society of Antiquaries of Scotland. He was a scholar and speaker of Scottish Gaelic and also fully appreciative of the Norse connections. He lived in London for a time when he worked for the British India Steam Navigation Company (he wrote a biography of his ancestor, Colonel Colin Mackenzie, the first Surveyor-General of India and renowned antiquarian). William emigrated to Australia and lived in Brisbane from 1884-1888 where he worked for the Bank of Queensland. He then returned to England, became managing director of a cotton importing company, and settled at Richmond Upon Thames. • In 1903 he published his first book, the 600 page History of the Outer Hebrides. It refers to the MacNeills of Barra, (see here on page 65) whom I mentioned here a few posts ago and whom Mackenzie interestingly connected back to a Viking called Njal who is said to have been the 'progenitor' of the Barra MacNeills - thereby confirming that very recent DNA discovery. • In 1908 he published his 400 page A Short History of the Scottish Highlands and Islands, which is online here. • In 1923 Mackenzie declined an invitation to stand for Westminster election as the Liberal candidate for Lewis. • In 1931 he published Scottish Place Names - review here. • In 1932 he published the 350 page The Western Isles; their history, Traditions, and Place-names (which appears to not yet be available online). He retired from business in 1934. In 1937 the Moray Press published Mackenzie's 326 page review of his own books entitled The Highlands and Isles of Scotland' and in 1938 he was made a Freeman of Stornoway. He died, aged 91, at his home at St Margaret's-on-Thames, in 1952. I intend to re-read the book over the coming months and will post anything relevant here. In our globalised age, regionalism is dwindling. Regional distinctives are less pronounced than ever before. The excerpt below shows how obvious they once were. by F. B. , Cumber, Granfhaw. Tune "Lovely Molly has an air "
It happen'd for a month or two. These freets and charms did not prevail. But yet nae butter they could get. Had Sawney summoned all his wits. The forcereft open'd the fcene. Who did not know her bafe intention. She drew a circle round the churn. But fhe would have the tailor's butter. When fable night her curtain fpread. Then fhe got on a flaming fire. For the bafe part that fhe has acted. But as he hates a fingle life. That fome auld wizard wrinkled wife. The Irish / Scottish Gaelic clan who have just turned out to be Vikings. Every single one of them. I had a very interesting conversation last weekend with someone I'd only 'met' online - like me, very into Ulster-Scots history - and researching her MacNeill / McNeill roots. We talked for a long time, including about John McNeill the preacher known as 'The Scotch Spurgeon' whose father was from Lisnagunoge near Bushmills in North Antrim. She's now arranging to take her father to Inverkip on the west coast of Scotland to visit McNeill's grave - I located it a few years ago and took plenty of reference photographs to enable it to be found again one day. That's a common story, and easy to accept due to the way history is often told. Until DNA ancestral research came along that is. A study by Professor Alex Buchanan at the University of Tasmania, of hundreds of people around the world all descended from Barra's McNeills, has found that every one of them is actually of Viking descent. Here is an article on HeraldScotland, the original source for the Niall of the Nine Hostages excerpt above. Stephen McNeil, the Premier of Nova Scotia in Canada seems a bit unhappy about the revelation and has insisted upon his Irishness. Other McNeils - in true online outrage fashion - are said to be 'devastated' and have resorted to large quantities of whiskey to drown their sorrows. Here is another Canadian article. Well, as I have blogged about before, Viking ancestry seems surprisingly common, my own DNA ancestry has revealed exactly the same, and as DNA studies continue I do think that 19th century ideas of (nationalistic) identity will be rethought and rewritten. Genetics and culture are not the same thing though - genetics are as ancient as humanity, whereas culture changes and shifts over the centuries through human influence. There is no 'pure' anything. But then there is this. You want social equality? Here it is, one of Scripture's great democratic levellers. PS: the Dublin Penny Journal of 28 September 1833 that the Irish O’Neills had come to Ireland from the Orkneys in the 9th Century, descended from Belus, who was King of the Orkneys before the birth of Christ. Originally their name was O’Nial of Hy Nial, meaning ‘chief’ or ‘prince’. Online here - similar to an article which appeared in the Belfast Monthly Magazine of 1812 which is online here and also in PD Hardy's The Northern Tourist of 1830 online here. Maybe more of Ireland is Viking than we are allowed to know. Dating from the late 1500s, the castle was heightened and extended in the early 1600s. Quite a pad. The Monypenny connection has continued right down in living memory in Hilary's family - her (late) great uncle Colin, a lovely man who gave me some of his theology books, had Monypenny as his middle name. You don't expect to find a Rear-Admiral from Portaferry named on a family tree in leafy Buckinghamshire! Just before Christmas 2014 when I gave a talk to Upper Ards Historical Society, I showed them this. Amy Anderson was kind enough to then send me some information she had on file from the Savage Estate rent roll of 1644. The Savages were an Anglo-Norman family who had been in the Ards Peninsula since the late 1100s. • his house and garden (£1 15 shillings). An Arthur Monypenny also appears on the Savage Rent Roll for 1641, leasing two unnamed townlands, and also on the Subsidy Roll for 1663, paying £3 12 shillings for Parson's Hall. Presumably this is the father of James Monypenny. Arthur was a high-ranking churchman, the 'Prebend' of St. Andrews Parish in 1620. He succeeded his brother Andrew Monypenny who had been the previous Prebend - according to Reeves' Ecclesiastical Antiquities of Down, Connor and Dromore Andrew Monypenny had been 'collated to the Archdeaconry of Connor on 18th March 1616". St Andrews Parish is here on the Ards Peninsula, dating back to the early Anglo-Norman era (St Andrews Parish Church is at the other end of the road we live on) - and of course there is a St Andrews back in Scotland in Fife, famous worldwide for its university and the Royal and Ancient Golf Club. The Monypennys had come to Ulster from Fife. Interestingly so did the local Bishop, Robert Echlin (1576-1635), who was from Pittadro, and would have been the superior of the Monypenny brothers. Echlin arrived in 1615 and set up his home at Ardquin Abbacy. When Echlin died he was succeeded by another Fife-born Prebend - Henry Leslie had been installed as Prebend of Connor (by Echlin) in 1619. What is interesting about this is that it slays the local myth about a Scottish v Irish quasi-apartheid on the Peninsula in the early 1600s. In fact, there were many Scots living as tenants on the southerly Savage estates - just as there were Irish tenants living on the more northerly Scottish-owned Hamilton estate near Conlig. As ever, the truth erodes the propaganda. Back a few generations and the family tree has a James Monypenny who died in 1638, marrying a Eupham Colville, the daughter of Robert Colville of Cleish Castle. This James and Eupham are said to have had "7 sons of whom 3 settled in Ulster between 1612 and 1620". Two of these sons were the above-named Andrew and Arthur. Another son, John, married Susanna Colville, whose father was the Commendator of Culross - another town in Fife which still today has superbly preserved 17th century architecture. "Having been declared privy to the slaughter of Cardinal Beaton, his kinsman, in 1546, he and his son received in 1553 a pardon from Mary Queen of Scots". So now the hunt is on to locate the plausible Monypenny residence in Portaferry. Given that they were churchmen, I wonder if the tiny 40 acre townland of Parson Hall might be the place? There is one farm there today. And are there any Monypenny gravestones in Portaferry? The Griffiths Valuation only has one Moneypenny in County Down - a Joseph Monypenny living in Ballymacarrett. It seems that this Rear Admiral James Monypenny is Hilary's g-g-g-g-g-g-grandfather. Mathematics mean that she will have 127 others! But it's interesting to make a connection across nearly 4 centuries of living here in the Ards Peninsula, a place which is still as interwoven with Scotland as it was back then. Michael Horton usually has interesting things to say. His latest book blows the lid off trend-obsessed 'radical' Christianity - the first book of his that I came across was the provocatively-titled Christless Christianity - and he was right, such a thing does exist and is actually pretty widespread. These three short videos make for interesting viewing. With much of Islam the core message is "keep the rules and you'll get in". The Christian message (if properly told) is "the standards required are beyond your reach. Jesus came to meet those standards on your behalf". I don't watch this tv show, but I caught this when 'channel-hopping' a few years ago. It doesn't want to embed, so here's a link.